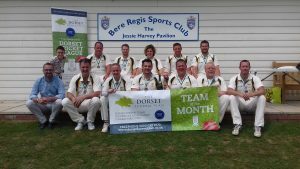 The Saturday First XI completed their first season in the Premier Division of the “Dorset Funeral Plan League” last season, having been promoted as Champions of Division One in 2017. They finished the season in 6th place and are now looking forward to a second year in the top division. On their way to becoming Division One champions in 2017 the team were named as “Dorset Funeral Plan League Team of the Month” for June.